Juice from one small lime (the same lime can be used for the zest and the juice). In a shallow glass dish, mix the oil, lime juice, lime zest, garlic, oregano, red pepper flakes, salt, and black pepper. Butterfly the breasts, and optionally cut into strips. Add chicken, and turn to coat. Cover, and marinate in the refrigerator for at least 3-4 hours, turning occasionally. Lightly oil the grill grate. Drain and discard marinade. 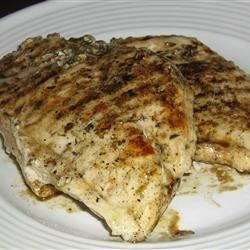 Grill chicken for 6 to 8 minutes each side, or until juices run clear.